A excellent gift for the Champagne enthusiast in your life. This set features three 75cl bottles of Moet & Chandon's Grand Vintage - one 2002 vintage, one 2004 vintage and one 2006 vintage. Grand Vintage 2002 - now hard to find, is a well-rounded, polished, harmonious wine with a complex, uncompromising personality. Warm harvest notes and notes of frangipani, white peach and nectarine, a velvety texture and a crisp finish make for an exceptional champagne (Chardonnay 51%, Pinot Noir 26%, Pinot Meunier 23%). Disgorged in November 2009 - Dosage : 5,5 g/l. 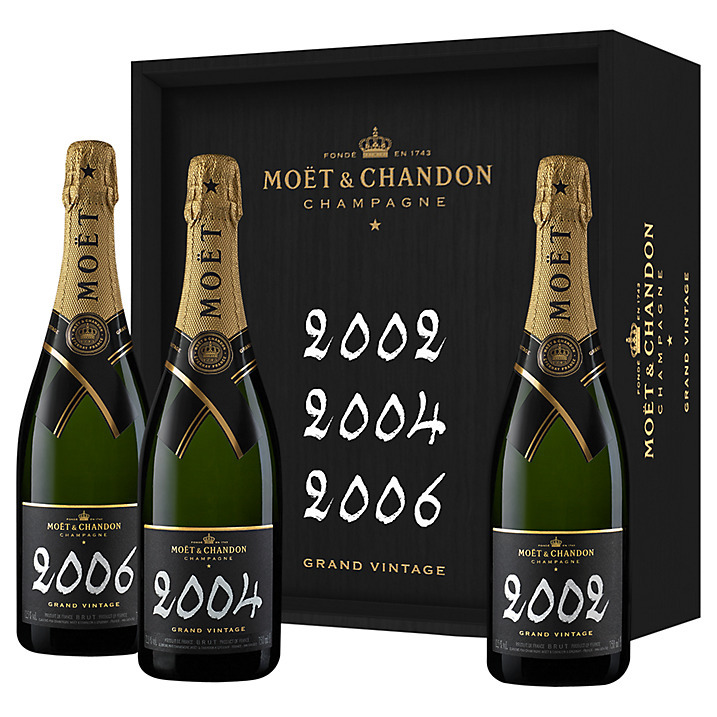 Moet & Chandon Grand Vintage 2004 has generous Grand Vin combining depth and brilliance, opulence and persistence expressing notes of mango, wooden spices and peppermint. Complex and mature, distinguished yet delightfully spirited.The deliberately light dosage (5.5 g/l), creates a firm, precise finish, deliciously tonic and refreshing, with notes of rhubarb and currant as well as citrus. The Grand Vintage Brut Magnum is the ultimate selection of the finest Chardonnay (50%), Pinot (34%) and Pinot Meunier (16%). Moet & Chandon Grand Vintage Champagne 2006 is a wine of delightfully fruity freshness. Notes of ripe fruits, peach, mango and banana, are rounded out with hints of white pepper, flint and marzipan. Floral notes and hints of honeysuckle develop beautifully in the glass. Dosage - 5g/l (extra-brut). 42% Chardonnay, 39% Pinot Noir, 19% Pinot Meunier.